Jewellery was a big part of Tudor fashion for those who were rich and important because it showed both their wealth and status. The most common types of jewellery were rings, bracelets, necklaces and earrings. These were made from gold, silver and bronze. 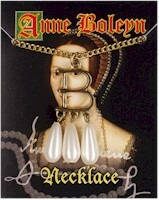 This pendant is made up of a 'B' and 3 faux pearls and is supplied on a gold chain. The fold-over information card is full colour on the front and has historical information on the reverse.